June 2009 Archives - mudd up! In 2012, Rupture gave away over a decade of his mixes. You can download them all here. “For those of you thinking of leaving Internet today — and there are many, I’m sure — I’d say just do it. . . Walk away. Internet doesn’t need your talent, your creativity and your intelligence.” yes. You heard the one about the scorpion and the frog? We can learn several things from this fable. One: animals can talk to each other. Since scorpions have no vocal cords, this might indicate telepathy. If human scientists devoted more time to unlocking the mysteries of inter-animal communication and spent less time building weapons to be abused by those in power, then many conflicts could be avoided. I, for one, would like to talk to elephants. Two: It is possible to feel the absence of feeling (“the frog feels the onset of paralysis”). In the amphibian world, drowning operates as a metaphor for the negative sublime. It is something the genus experiences second-hand, at an uncanny step of remove. Herodotus alluded to certain unorthodox interpretations of this fable which cast the frog’s mortal feeling of no-feeling as a register of empathy for inert objects such as chocolate bars or computers. (Greek empatheia, literally: passion). Herodotus’ status as a liar and a plagiarist do not lessen the acuity of this scholarship. Unlike our telepathic insect, he was sponsored by the Greek goddess of victory. Three: It is the scorpion that pulls humanity down. If you yourself are not a scorpion, or if you can’t swim, then you are unable to play every move of every game in the cooperation zone, because sooner or later you will meet a scorpion. A real scorpion. Many live in arid or semi-arid areas where unpolluted water is scarce. Yeats’ judgment that “things fall apart, the center cannot hold”, because “the worst are full of passionate intensity” is a recognition of the fact that scorpions are real. reader response # 1 : I’ve always been fond of that Yeats quote. “The worst are full of passionate intensity” is an obvious but essential piece of knowledge. The first time I came across the story of the scorpion and the frog, it struck me as somewhat insulting and reactionary – a person’s nature is definite and static, and there is no hope for them to change, even as their lives depend on it. It’s a engagingly doomed-romantic notion, sure, and it’s been pretty much the basis for all of favourite films, book and plays, but the optimist in me doesn’t want to BELIEVE it. Dear reader: Martin Heidegger’s ‘The Heraclitus Seminar’ references (somewhat inconclusively) a variant of the tale much more in line with your optimism: instead of stinging the frog, the scorpion performs a mad celebratory dance — the bug has realized that its essence can be changing, dynamic, just like Heraclitus’ famous river, into which one both can and cannot step twice. ‘Biology is not fate’, it thinks in its chitinous little head. The scorpion expresses this epiphany to the frog via a mixture of pheromones and vibrational communication, putting it at odds with Herodotus’ postulations of animal-to-animal telepathy and leading to the historic suppression of this tale by a strangely powerful Flemish legal council, of whom Yeats was a sympathizer, esp. during his theosophist latter years, a time of intense public ridicule, when the poet’s wife George wrote volumes ‘automatically’, channeling the spirit of Leo Africanus, who does not read blogs because he is dead. In the so-called Upbeat Heraclitian variation, the animal pair cross the river to safety. Upon reaching the shore, the altruistic frog returns into the stream for a swim. Moments later the scorpion gets eaten by a bat. Waves of positivity emanate from the human observer, gently touching all within radius, like the surface of a pond into which one has just thrown a bag of cats. The dark legend of poetry is that it is true. this Friday, come join us @ Glasslands in Brooklyn for another installment of the Dutty Artz party, New York Tropical. music by: DJ /rupture. Matt Shadetek. Geko Jones. Lamin Fofana. Glasslands, 289 Kent. williamsburg $5 before 11pm, $8 after. Subtitled version of Inja Kojast Inja Iran Ast Sarzamine Mano To – a woman recites a timely poem while filming the rooftop shouting of “Allah-o Akbar” in Iran yesterday. Audio added from a live performance by DJ /rupture & Andy Moor. My friend, filmmaker B, whom I am not allowed to call Texan, is in Iran right now. Sending out dispatches via email. After the photo is an excerpt from dispatch # 11. The personal weight and texture of an email augments the realness of the situation, at least for me. It is so easy to change your Twitter icon to green and read newsfeeds… the hard thing is anything else, information into action. Returning to New York’s poverty and hi-rent capitalism was particularly strange after spending so much time this past tour in Scandinavia and the Netherlands. (Staying in a now-legal squat in Amsterdam, playing at some festivals with arts funding and kids paid to curate and produce them.) Northern Europe has its share of problems, yes, but also strong social nets for its citizens (health care, education..). The challenge is not to remain informed about large-scale upheaval abroad (although that is part of it), but to find things to push towards and fight for, here, on one’s block, neighborhood, city. Distance is comforting. Intimacy is the hard part. Maybe I’m just saying I’ve got too many broke, talented friends in NYC who are just barely hanging on, and that I want this city to resemble us, our city, more than it does now. It is hard to know exactly what is happening in the top ranks, and what political phase the country is moving into. It is a time to be thinking, interacting, and planning. There is no real strategy nor an idea of what shape this action should take. It is refreshing to be constructing a movement with people and working towards something collectively without leaders around or political parties, but at the same time, there is no hope of having enough force to confront the regime without some structural help or some internal battles being fought at the top levels – that is unless we want this to become a bloody battle once again. But with the thousands killed during the revolution and the purges that took place afterwards on everyone’s minds, this is not what people want to move towards. Not now at least. The resilience and the determination to change things peacefully is remarkable for me. It has made me think about a lot, and to watch how people work together to maintain silence during the demonstrations is beautiful. At yesterday’s quiet march, people held signs with sentences, slogans, photographs of the violence of the past days, and the names of those who have been killed. There was a feeling of mourning in the air, but also of tension. We all know that things are serious, and our great numbers in the streets are our only protection. This will continue until we achieve the minor request of announcement of election fraud, or until people tire and move towards other methods. There is the possibility that those imprisoned remain there, that Moussavi is done away with by some means (exile, house arrest, etc), and that Ahmadinejad remains the illegitimate president of an unlawful dictatorship. If this happens, the next four years would mean major organizing in the underground and a new stage in Iranian political activism. One thing is sure: people are no longer going to accept the self-censorship or fear that has been imposed upon them. It is already easier to speak to people on the street and in shops without wondering if they work for the secret service, or if they will tell the police. Our collective trauma from SAVAK times, and mainly from the Islamic form of ideology and socio-political cleansing that has taken place for the last 30 years, persists today. Yesterday was a reminder of that. In addition to this psychological war that the regime wages upon us by cutting our connection to the outside world, and to each other, there are a number of ways that we are threatened. I cannot go into detail now, but starting yesterday morning, our house received phone calls every 15 minutes from an unknown number. The caller ID showed a number with many zeros at the end, which from our experience means that the secret service or police are trying to get in touch. We did not answer, and luckily I had taken all my videotapes and other things to another house, but there is a still a feeling of insecurity. Like many others in the city, our house had become a sort of unofficial ‘newsroom’ with people coming in and out, working, making phone calls, emailing, and sleeping in different spots around the house. We decided to calm things, now that Facebook, Twitter, Youtube and blogging have made it possible to announce our resistance to the world. But this is precisely what we are worried about, that the psychological games of the regime and the disappearances and arrests will begin again, at an even harsher intensity. Last night Bassijis were roaming the neighborhood, going into some homes to gather satellite dishes. We got rid of a lot of things, hiding others. This is what will begin happening; and paranoia will set in again. We can already feel it. Now we have word that some of the reformists and other political figures are saying that they should put an end to the direct opposition to the Supreme Leader. This is disheartening for us. Right now, there is definitely a threat to the tight grip that Khamenei maintains over the people, and within the hierarchical structure of the Republic; a threat as well to the pillars of the 1979 revolution. As of today, we have reports of 500 people arrested: political leaders, students, activists, journalists, and others who have been suspected of dissent. 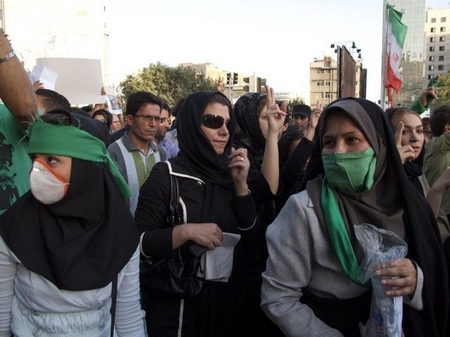 The latest news is that the French Embassy in Tehran has been attacked. Fifteen members of our Documentary Filmmakers Association have been arrested in the streets since Saturday, despite having official permits to film in the streets. Many of them were beaten by plainclothes police or Bassijis, and their homes have been raided. There is a harsh crackdown. I am debating on leaving soon, before it becomes impossible to do so. We are strategizing, trying to be pragmatic, and intelligent. It is a hard situation to judge. Breaking news! Mudd Up radio, my weekly radio show on WFMU 91.1 fm NYC, is moving from Wednesday nights to Mondays. Tonight is the last Wednesday show. We’ll return early next week, Monday June 22nd, when WFMU’s summer schedule kicks in. The time, 7-8pm, remains the same. I’ll be after Douglass Rushkoff’s show, and Vicki “People Like Us” will slip into my former slot. In other words: all good. Despite my prejudices I’m almost entirely digital for the portability and the wide spectrum of possibilities that comes with it but one thing that keeps me yearning for analogue is the noise of it. My main problem with digital music applications is the silence that is there to start with. If you record nothing at all onto analogue tape and play it back there’s still something there. Busy on tour, the blog gets a bit neglected… Andy & I are playing Tuesday through Sunday, a show (or two) each night. This much real-world sound translates into online silence (I don’t have an iPhone). Warding off that soundlessness, here are two ultra-fresh new jams ::: MAJOR LAZER ft. Jahdan & a SWEDISH PIRATE CUMBIA REMIX by yours truly. 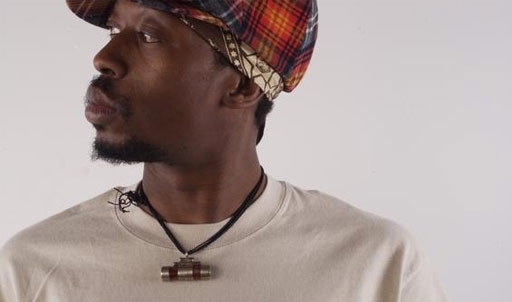 first up: June is a good month for Dutty Artz’s Jahdan Blakkamoore, he features on Diplo and Switch’s reggae project ‘Major Lazer’ (album streaming now, out next week), and Jahdan also drops some verses on a Lee ‘Scratch’ Perry 12″. Here’s our man nicing up a Major Lazer tune. It’s a pleasant surprise to hear Dip & co. workin with JD in a conscious roots reggae mode (JD’s roots roots run deep). Cash Flow is a very satisfying appetizer to the incoming Jahdan Blakkamoore album Buzzrock Warrior (produced by Matt Shadetek, myself, and the Dutty Artz family, out this September on Gold Dust). Which will crush everything. I’m in love with D.F., Mexico City. Forget leafy Berlin, let’s all move there, sísísí! Cumbia DNA courtesy of Discos Barba Azul. Guitar by Andy Moor. Swedish Pirate anthem remix files here. Matt Shadetek and I mixed & produced a lot of music for the above album, nearly all of which we recorded in Geko’s living room. Straight DUTTY. We enlisted the skills of friends like Modeselektor, Maga Bo, Durrty Goodz, Chancha Via Circuito, and of course hometown fam 77Klash & Abena Koomson. We think it’s the best thing we’ve ever done, and we’re pleased to announce that Gold Dust agree with us! We (Dutty Artz) just signed a worldwide license deal with them, ensuring that Jahdan Blakkamoore’s debut album, Buzzrock Warrior, will sound far & wide. Brooklyn Tropical?!?! Dubstep Pop?!?! Whatever beast we’ve created, it’ll hit the world this September. For warmup, look for Jahdan’s “The General” single out now, and his upcoming track on Diplo & Switch’s Major Lazer album project. 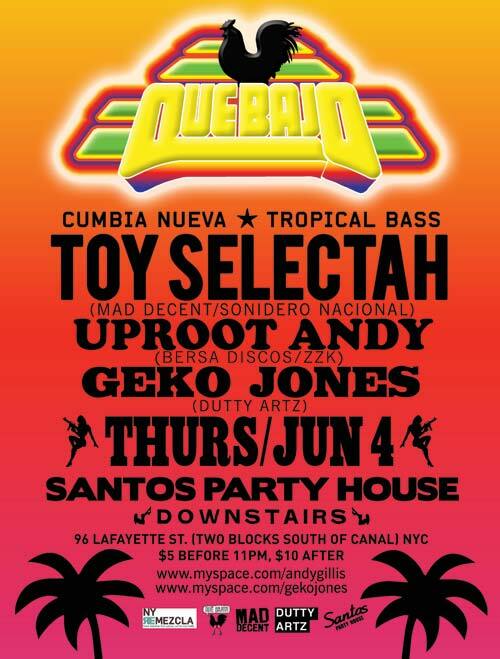 I’m still too busy in Barcelona to post new audio, but New York can listen to Toy live tomorrow (@ Santos Party house with Dutty Artz family). Or win tickets to the show on my radio show tonite. I’ve prerecorded the music and Lamin Fofana will be holding it down on the mic. I upped this tune over at La Congona a few weeks ago – Toy remixing Santogold in a cumbia-gone-doubletime style. Around the corner from where I live they now sell “BROOKLYN WE GO HARD” t-shirts. Reach!